Newspaper headlines: Must May quit to secure Brexit? Image caption There is speculation on several front pages that Theresa May will be urged to quit in order to secure backing for her Brexit deal. 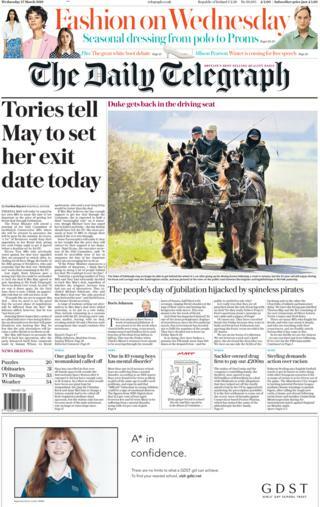 The Daily Telegraph says that at a meeting of the Conservative backbench 1922 Committee, the PM will be pressed to announce she will be gone by the autumn, in return for many Brexiteers dropping their opposition to the deal. Image caption The prime minister's appearance before backbenchers comes "amid renewed signs that Leavers are preparing to back her in a third meaningful vote rather than risk seeing Brexit slip away altogether", says the Guardian, which leads on the same line. 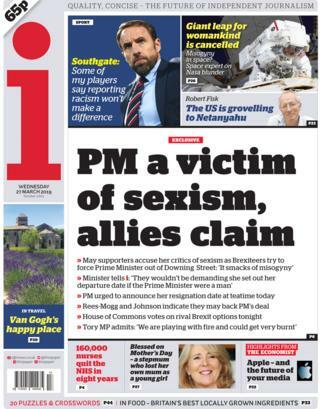 Image caption However, one of Mrs May's supporters tells the i that calling for her resignation "smacks of misogyny", and that a male prime minister would not face the same treatment. Image caption Even with Mrs May under intense pressure, the Daily Mail reports that one of her arch opponents is on the verge of falling into line. Jacob Rees-Mogg, who chairs the Brexiteer European Research Group, writes in the paper that he will back the deal because "all other potential outcomes are worse". 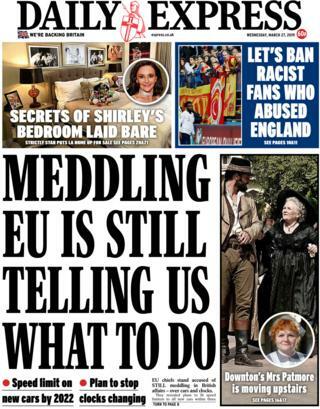 Image caption However imminent Brexit may be, the Daily Express says EU chiefs are "STILL meddling in British affairs" by scrapping seasonal changes to the time and drawing up plans to prevent cars from driving faster than the law allows using speed limiters. 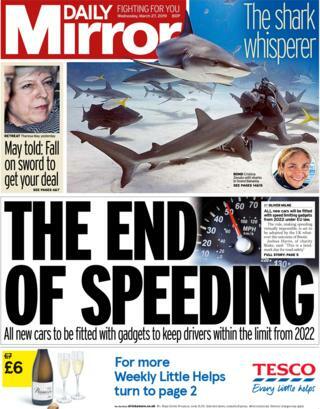 Image caption The Daily Mirror envisages "the end of speeding" in its front-page headline. 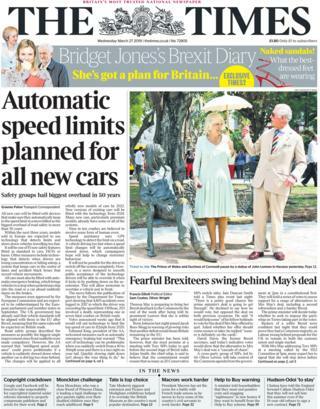 It says that regardless of the outcome of Brexit talks, the UK is set to adopt laws requiring the fitting of speed limiters that will make driving over the limit "virtually impossible". It quotes the road safety charity Brake celebrating the news. Image caption According to the Times, cars will also be required to use automatic emergency braking systems which bring vehicles to a stop "when pedestrians step into the road or a car ahead suddenly slams on the brakes". Image caption The Sun claims an exclusive report that £1m in gemstones was stolen in a raid at a London jeweller. 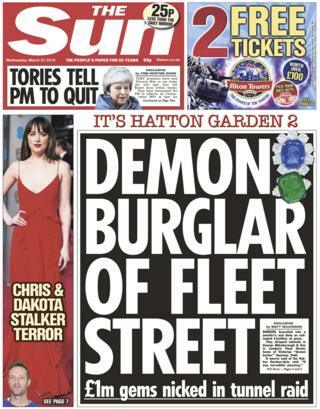 Saying the burglars tunnelled under the Fleet Street shop, the paper describes the raid as "Hatton Garden 2" - a reference to the infamous 2015 tunnel raid, also in central London. Image caption The Daily Star reports that a TV documentary is to chart the fall from grace of TV's Ant McPartlin, who has struggled with addiction. 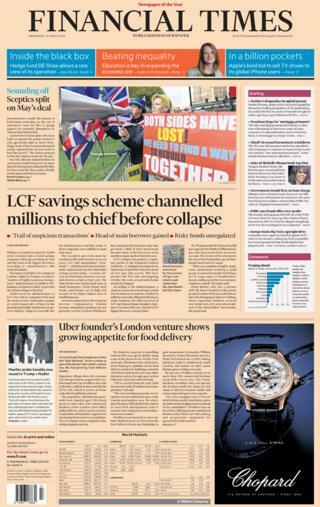 Image caption The Financial Times leads with the latest on the administrators' report into the collapse of the LCF savings scheme, which is thought to have cost investors millions of pounds. 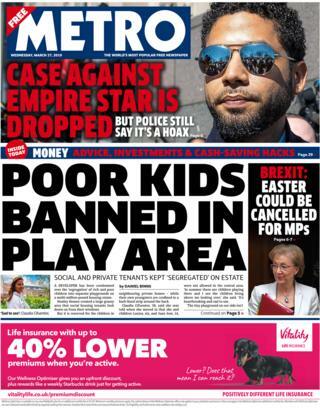 Image caption And the Metro reports that a London developer has segregated play areas by blocking social housing tenants from using communal play areas accessed by the children of wealthier homeowners. Even as front pages ponder whether Theresa May will name her "exit date" from No 10 to secure the support she needs for her Brexit deal, there's speculation over who might replace her. Writing in the Daily Mail, Henry Deedes assesses those jockeying for position. "Of the runners and riders, quickest out of the starting gate will be those zealous stallions Jeremy Hunt, Sajid Javid and Boris Johnson, though the last of these may require gelding if he is to stay the course," he writes. But he says punters should keep an eye on the stayers rather than the sprinters, wondering "might flashy young colt Matthew Hancock be worth a small flutter"? Ambition, he argues, pumps through the 40-year-old health secretary's "unsullied arteries" like cortisone. It's Mr Johnson who's making headlines in the Daily Telegraph. It carries an abridged version of a speech he delivered in London on Tuesday night in which he described - in characteristically colourful terms - his regret that Brexit won't be delivered this Friday. The former foreign secretary told his audience that this was meant to be a week of jubilation, he says. But instead: "In one of the most protoplasmic displays of invertebracy since the Precambrian epoch, this government has decided not to fulfil the mandate of the people." Mr Johnson continues: "On Monday night we saw the extraordinary spectacle of a government collaborating in the hijacking of the ship of state - captain and crew cravenly handing the helm to the pirate [Tory MP Sir Oliver] Letwin - so that these backbenchers are now charting the way ahead." Sir Oliver, whose cross-party indicative votes amendment won the support of the Commons on Monday, is given a scathing appraisal in the Sun's leader column. It says Brexit is today in the hands of "Parliament's most blunder-prone Tory buffoon". It's hard to imagine how things could get worse, it continues, but "this diehard Remainer and Old Etonian twit" will find a way. However, the prime minister's deal may yet win the support it needs. 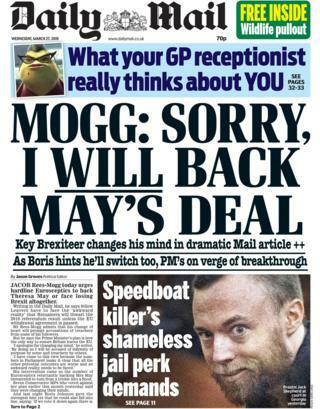 While leading Brexiteer Jacob Rees-Mogg calls Theresa May's Withdrawal Agreement a bad deal that does not deliver on the promises made in the Tory party manifesto, he writes in the Daily Mail that he might back it after all. "I apologise for changing my mind," he says, adding that his support for the deal is conditional on Northern Ireland's Democratic Unionists also giving it their backing. "I have come to this view because the numbers in Parliament make it clear that all the other potential outcomes are worse and an awkward reality needs to be faced," he writes. Away from Brexit, remarks by MP Sir Christopher Chope about knife crime have attracted the ire of the Daily Mirror. The Conservative backbencher told the Home Affairs Committee that teenagers at risk from knife violence should learn martial arts, or get fit to ensure they can follow police advice and run away from trouble as fast as possible. In an editorial, the paper accuses Sir Christopher of appearing to blame teenage victims of knife attacks for the terror inflicted. It brands him a reactionary, a clueless old duffer and a Tory dinosaur who is "an embarrassment to his constituency, party and country". 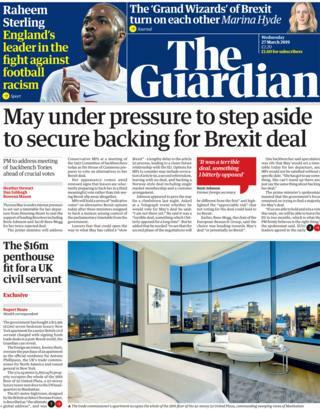 The Guardian carries details of a £12m, seven-bedroom luxury New York apartment it says the government has bought for the British civil servant charged with signing fresh trade deals post-Brexit. According to the report, Foreign Secretary Jeremy Hunt oversaw the purchase of the apartment which will be the official residence for Anton Phillipson, the UK's trade commissioner for North America and consul general in New York. The property occupies the whole of the 38th floor of a 42-storey luxury tower next door to the UN headquarters in Manhattan. Designed by the British architect Norman Foster, it's described as "the ultimate global address". Finally, have you ever helped a child with their homework and realised you're more baffled than they are? Well, you're not alone according to the Times. The paper says a revamp of the curriculum has left many parents bewildered by fronted adverbials, quadratic sequences and the role of the omniscient narrator. It says the problem has become so acute that a teaching company has started up a tutoring service for parents, aimed at helping them understand modern teaching methods.